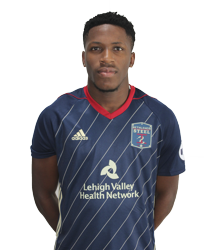 Bethlehem Steel FC has signed its second Cameroonian player of 2018, Faris Peme Moumbagna, the club announced late Monday afternoon. He is eligible for the coming game at Red Bulls 2 this Wednesday. He has asked to be known by the single name “Faris”, even though his shirt may be more complex. Faris is an 18-year-old striker. He is listed as 6’1″ and 178 pounds. He first suited up for his U-20 Cameroonian national side this May as a 17-year-old substitute. He appeared in the second half of the deciding match against Uganda that put the young Indomitable Lions through to the next round of qualifying for a youth tournament next year in Niger. PSP suspects there is a desire to see him on a game pitch immediately, reflecting the imminence of the Sporting Director’s departure. (It would have been sensible for the organization to have asked Earnie Stewart for a final evaluation of both rosters before he leaves August 1st.) Certainly Steel head coach Brendan Burke will appreciate the reinforcements. He made an indirect cryptic reference to the young player on the very first day of official Bethlehem preseason practice back in late January and has quietly revisited his arrival a few times since. 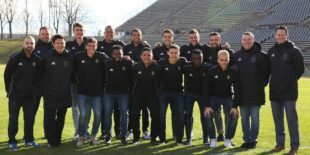 A source with knowledge of the situation indicated that Faris met the Steel in Atlanta during Bethlehem’s sojourn there for last Wednesday’s match, and flew back with the team to Philadelphia. In the last few days he has been recovering from travel, having flown from Cameroon to Paris, France and then on to Atlanta, and then practicing with the Union as he begins to learn the Union way of playing. Reportedly he speaks some English. Faris’ acquisition was a months-long process due in part to his age and paperwork issues. Faris turned 18 on July 1 seventeen days ago. Faris joins veteran Eric Ayuk, and 2018 signing Olivier Mbaizo as the Cameroonians currently with the organization. One visit to Africa last off-season by coach Hogan and one visit to an unexplained location by coach Burke have come to final fruition with the signing. (Editor’s Note: Coach Burke kindly corrected Tim’s mis-impression about a Burke trip to Africa Tuesday 7/17/18 at practice.) Between them the Steel’s two coaches evaluated Mbaizo and Faris, and Burke also saw Michee Ngalina who is from Congo-Kinshasa. Welcome, Faris! Mbaizo has looked good. Great to hear Burke and Hogan actually went to Africa to get the deal done. Looking forward to seeing him on the field! As I understand it, the trips confirmed the organization should pursue the matters further. Completion of the deals happened in this country with the actual signings. Both Ngalina and Faris were under-age by U. s. Child labor law when coach saw them on his visit. Please note the correction inserted above Tuesday afternoon. The error is mine. I jumped to a conclusion by mistake. Hey, cool. Thumbs up, BSFC.